We only have a few photos but many profound memories. He is not forgotten. He was one of a kind and it’s a miracle he lived at all. He came to us one day in spring 2005 from our neighbor’s farm. 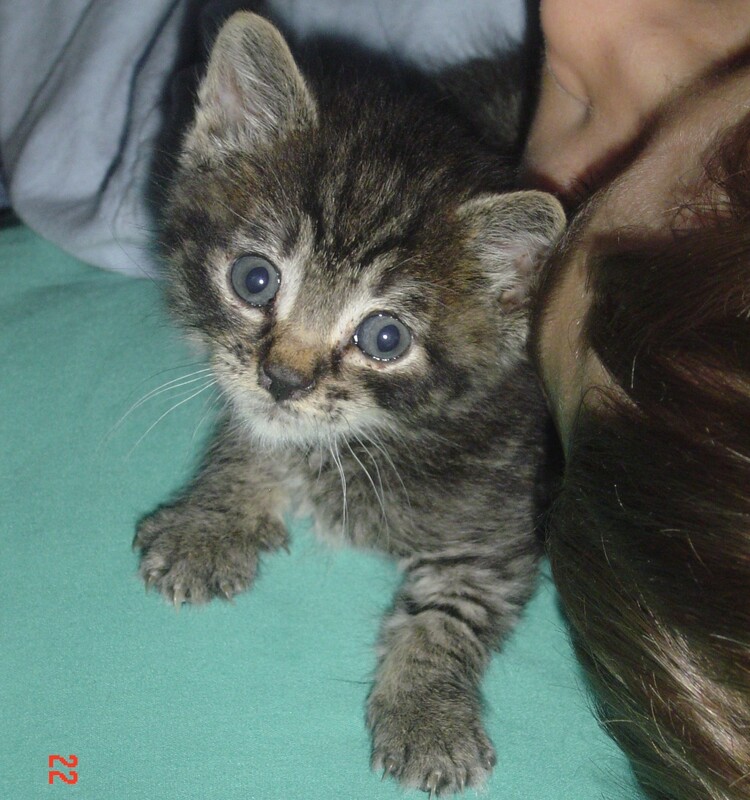 His mother and her litter had been attacked by dogs soon after they were born and only Momo and his sister had survived. We never had a chance to name her as she died quickly. He was a fighter. As soon as we saw him we knew something was wrong: he had trouble holding his head up without shaking and he did not have control of his body. He had suffered neurological damage from his ordeal and was barely holding on. But he was tough and persevered. After he gained some strength he ventured out into our yard. He joined our menagerie of pets including two dogs, three horses, chickens and barn cats. His first chore was learning to walk. Since he couldn’t control his legs he learned to roll from place to place. Pretty soon we’d find him all over the place, rolling from here to there, slow but consistent. He’d sleep in the sun on our deck between journeys, usually cuddled with our dogs. As he got older he developed a great interest in birds and would spend hours sneaking up on a bird in our yard with stealth rolls then suddenly leaping into the air in a sneak attack. He so consistently fell short of his targets that the birds learned to taunt him by standing close, but just out of reach. Momo, however, was not deterred and just keep trying, over and over. When our kids came home from school he’d come rolling and jumping down the driveway to greet them, slow but sure and full of energy. Ultimately he just wanted attention, to be petted, to cuddle. And then one day he was just gone. Disappeared. We called for him everywhere but something must have taken him, be it an owl, a hawk or some other predator. It was a huge loss. Now, many years later, I can’t forget him. I reflect back on Momo and wonder why he came to us. And here is what I have learned: despite his obvious limitations he learned to adapt to his strengths, not his weaknesses, and he never gave up – it’s wasn’t an option. He never dwelled on what he could not do – and as a cat he couldn’t – because he didn’t know what was “normal” so he just lived his life as best he could. More importantly: all he gave to us was love and affection and all he wanted was the same in return. One pat on the head, one cuddle and he started to purr. He just wanted to be with us, to be part of our family; to be held and loved, and to wander throughout the yard. The miracle is that he survived long enough to teach us how to adapt, to survive, to roll with what you have, and not dwell on what you don’t have. The miracle is that we are all better people for having known him. He was one powerfully kitty. Aw, what a great cat, and an awesome tale. Even his name rolls on two wheels. Thanks, Dr. A! Keep on rollin’ Momo! Lovely post. Sorry you lost him. I’m glad I got to know him if only for a day. Sweet person, I mean cat.